Somehow it looks like South America - scratching a living out of a two bob truck and dodgy roads up to the mine? Spot on!! But where in S.America? Back to Caen for a day.Sorry I can't play with you because in Beuvron the connection with the net is awful.I will join again in September.Enjoy your puzzles. This seems to be high up. Could it be in Chile? It could be Chile, or Peru, but it ain't. That cuts down on the available options quite nicely. western Argentina foothills of the Andes? Very morainey country here. Not in Argentina either. Not much left to choose from. Yes it is from the Cerro Rico Mine, near Potosi, Bolivia. Our oldest son spent some days there a few years ago, acclimatizing for the trek to even higher elevation in the Andes. Well done, your turn next. A gray day on a dry and rocky coast somewhere in Southern Europe? You are on the track. 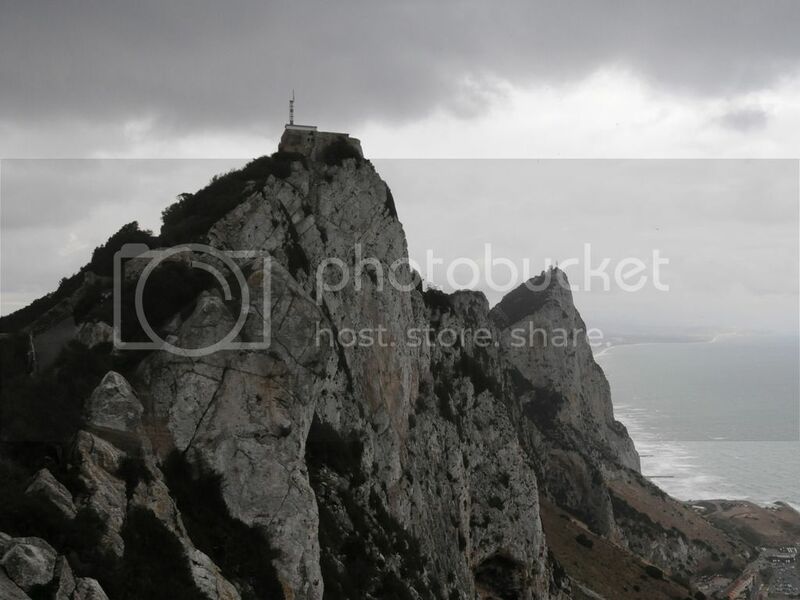 This just has got to be the rocks at Gibraltar.... the give-away for me was the sloping hills at the bottom of the rock. Spot on, your turn next. Nice! For a change, I got it.... I had some true troubles searching for a place that would perhaps be a challenge for all of you, but hopefully, this one may be a fitting challenge. Naturally, need name of place and country! If you're right Ralf - and I bet you are - that's an amazing feat of memory! Certainly looks like you're right. Is that the opposite of a Senior moment? I believe they were in better shape last they appeared here?? The houses were located in Sanzhi, Taiwan. See link for more photos of the area. Last photo shows the area where everything is now demolished. The weird and wonderful Sanzhi Pod City, or UFO houses (on account of their flying saucer-like shape), was an abandoned resort complex in Taiwan. Pod City was marketed as a holiday resort for U.S. military personnel posted to East Asia. SOOOOOO EMBARRASSING.... a senior moment from me! Oistein is off course correct..... So hard to remember with a 369 pages long thread.... ! So, where is the replacement puzzle?? OK are you finish being embarrassed now so we can have a replacement puzzle? If not, maybe Oistein can oblige, since he spotted the mistake? A try to restart this friendly thread. Oh, goody, goody, another puzzle. On second thoughts - he-e-e-elp!